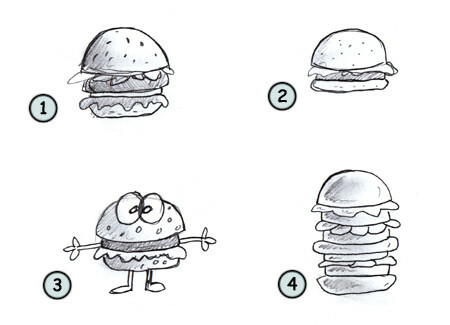 Drawing a cartoon hamburger: some fun facts before starting sketching! The word hamburger probably appeared in the end of the Middle Ages. The cheeseburger was invented in 1924 by Lionel Sternberger. If you take a look at the shapes of this gigantic and delicious hamburger, you should notice that it is mainly made of circles. Lucky enough, I did use some colors to make sure the whole thing could be readable. Now let's see how we could draw a simple, funny cartoon character in the shape of a hamburger! First, draw two rectangles to represent the buns. Then, add four small rectangles to make the arms and the legs of our character. Next, work on the outline of the buns. When you are finished, make sure the arms and the legs are also well drawn. Then, add details like the eyes and the beef. Adding some color will make the final image really more alive! Drawing a nice hamburger is really simple if you can easily draw a circle. You can make it funny (3), realistic (1) or a little more simpler (2). 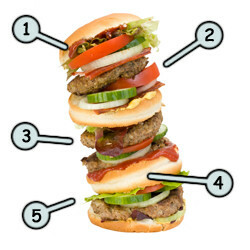 Don't hesitate to play with your hamburger and add the ingredients of your choice! Hungry?